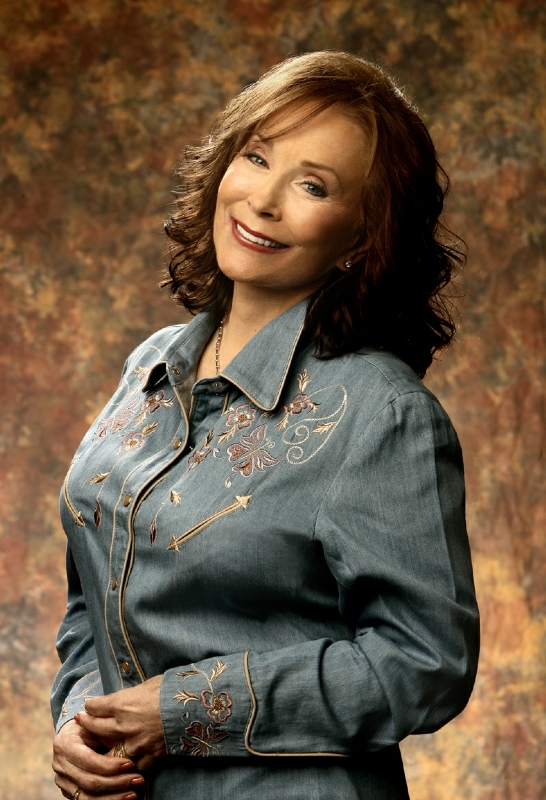 Loretta Lynn (born as Loretta Webb in Butcher Hollow, Kentucky), she is also known as The Coal Miner's Daughter, is a famous Musician from USA, she is 84 years old and still alive, born April 14, 1935. Loretta Lynn is an American singer. She ran most of country music, but she was not really popular until the early 1960's. She has over the years released many albums, including with Conway Twitty. Among other things, she released the album Just a woman, which was recorded in 1985. Her autobiography, Coal Miner's Daughter, was filmed in 1980 and Sissy Spacek won an Oscar for her portrayal of Loretta Lynn. Her sister Crystal Gayle is also a famous Country artist. Our collection contains 58 quotes who is written / told by Loretta, under the main topics: Car, Marriage, Mom. "Who wants to be married to a grandfather?" "When I'd tell people I like country music they'd get this look on their faces. People were kind of ashamed of country"
"When all those city folks try to fix up my talking, all they do is mess me up"
"We still lend our old house out to relatives. They keep a guest book for my fans to sign"
"Some of my friends who know me best say they wouldn't trade places with me for $1 million because of the pace I lead"
"My attitude toward men who mess around is simple: If you find 'em, kill 'em"
"How do you measure your value?" "Daddy was real gentle with kids. That's why I expected so much out of marriage, figuring that all men should be steady and pleasant"
"Being on stage is the best part of my career. I just say whatever comes into my head. It's the only time I feel grown-up and in control of things"
"Because Olivia Newton-John wasn't from Nashville, they didn't like her winning our awards. I've got no complaints"
"When I first came to Nashville, people hardly gave country music any respect. We lived in old cars and dirty hotels, and we ate when we could"
"Me and my partner, Conway Twitty, cleaned up at the 1972 Country Music Association Awards"
"I think Charley Pride has been one of the best things to happen to country music, to prove it belongs to everybody"
"Doolittle looked just like a little toy soldier the first time I ever saw him"
"A woman's two cents worth is worth two cents in the music business"
"I never rode in an automobile until I was 12"
"Mommy smoked but she didn't want us to. She saw smoke coming out of the barn one time, so we got whipped"
"You get used to sadness, growing up in the mountains, I guess"
"Nobody's perfect. The only one that ever was, was crucified"
"I've seen every highway in the United States, and they all look alike to me"
"I refuse to be pushed around anymore"
"I never knew any Jews until I got into show business. I've found them to be real smart and good workers"
"I get along with all the women singers, but especially Dolly Parton. We talk the same hillbilly language"
"I didn't know how babies were made until I was pregnant with my fourth child"
"I've always been full of nervous energy, but I'm not really as happy as I seem"
"I'm trying to lead a good Christian life, so there ain't too much spicy to tell about me"
"I'm not a big fan of Women's Liberation, but maybe it will help women stand up for the respect they're due"
"Growing up in eastern Kentucky like I did, I'm used to having a few guns around to protect me"
"A lot of people say I'd miss show business if I quit. I'd miss some of it. Now it's the only life I know"
"I've seen country music go uptown, like we say, and I'm proud I was there when it happened"
"I've been married to the same man for all this time. The way we fight sometimes, you can tell"
"I was married when I wasn't quite 14 and had four babies by the time I was 18"
"I know there's some kind of history to mountain music-like it came from Ireland or England or Scotland and we kept up the tradition"
"You can't be halfway in this business. If you don't meet the fans, you lose all you've got"
"When something is bothering me, I write a song that tells my feelings"
"The country is making a big mistake not teaching kids to cook and raise a garden and build fires"
"My biggest hero, Gregory Peck, was my birthday present on April 14, 1973. I just sat and stared at him"
"In the long run, you make your own luck - good, bad, or indifferent"
"I want more out of life than I've gotten"
"I love people and I love to sing, and that's what keeps me going"
"I believe in horoscopes. I was born under the sign of the Ram, which means I'm headstrong, don't like people telling me what to do"
"I avoid going through places where there's too much poverty"
"Doo never actually made moonshine, but he hauled about an ocean of it"
"Do the best you can with yourself and hope for the best"
"There's always been a man telling me what to do"
"I loved being outside. We'd hold lightning bugs in our fingers and pretend they were diamond rings"
"I know what it's like to be pregnant and nervous and poor"
"I don't like to talk about things where you're going to gt one side or the other unhappy. My music has no politics"
"I don't go to church regular. But I pray for answers to my problems"
"I ain't got much education, but I got some sense"
"You ain't supposed to get salmon when they're swimming upstream to spawn. But if you're hungry, you do"
"We used to go around tipping outhouses over, or turning over corn shocks on Halloween. Anything to be mean"
"I've been around a long time, and life still has a whole lot of surprises for me"
"I was the first woman ever named Entertainer of the Year in country music"
"I try to visit people in hospitals when I can, smiling and joking while I'm there. But when I leave, I just start crying"
"I believe in education and wish I had a better one"
"Back then, we didn't know we were poor, and people were more proud then"